Being reluctant herself when approached to make a movie stemming from the tragedy at Sandy Hook Elementary School in 2012, Kim A. Snyder knew once she completed her stirring new documentary “Newtown,” it wasn’t going to be an easy sell to audiences. More so than even Snyder could know. It was at a screening this past June at the Greenwich Film Festival just 50 miles away from Newtown where U.S. Representative Jim Himes of Connecticut was said to have been inspired to stage a sit-in later that month in the U.S. House of Representatives to urge Congress to take action on greater measures for gun control, and since premiering at the Sundance Film Festival in January, Snyder has been taken aback by the reactions at screening after screening in cities across America of the film, which soberly recounts the massacre that left 20 children dead as well as six adults and gradual healing process that followed. Yet “Newtown” is a film of quiet power, intricately constructed to offer firsthand accounts of the shooting to deliver a perspective on the widely covered incident that’s never been seen before while becoming universal in its specificity, coalescing around three families — the Bardens, the Wheelers and the Hockleys — who lost their sons Daniel, Ben and Dylan, respectively, on that devastating day. Although a sense of loss pervades the film, there is never a sense of defeat, with interviews conducted against a stark black backdrop each conveying the strength of those speaking as they find words for the unspeakable, and Snyder, who previously embedded herself in a community for her previous film “Welcome to Shelbyville,” about an influx of Somali refugees in a small Tennessee town, moves with gentle persistence from individual victims to the whole of the 28,000-strong town, from the emotions of grief to acceptance of a new normal over the three years she spent filming, and eventually the desire on the part of Newtown residents to turn their experience into one the entire country could learn from. During a stop in Los Angeles as part of a release that culminates with a national town hall screening on November 2nd, Snyder spoke about the challenges of handling such a sensitive subject and conveying a well-known event in an impactful and arresting yet never sensational way, as well as how she first came to Newtown and the unexpected responsibility of giving its residents a platform. Almost four years ago, I, like millions of other Americans, heard that horrible news come through on the radio, and I never really imagined that I was a person who was setting out to make a film about gun violence, but happenstance landed me four or five weeks later up in Newtown where some folks I had worked with in the past gave me a call and said, “Listen, we have these contacts and we’re exploring some short form material. Would you consider going up there and developing something?” I was completely reluctant. I [thought] there’s going to be a million news cameras and I don’t come from news, and I’m a private person, so the whole thing was just stomach turning. But the first connection I made was with Father Bob Weiss, and I started to get a sense of the enormity of tragedy, not only for the community, but for the [faith leaders]. I was very compelled by this broad look at the entire community I never had it as a goal I’m going to make this film, but it evolved like pulling at a string where I became more immersed in the experience of collective grief I was feeling. As a longform documentarian, I felt could do something different than all the news cycle had done, so I started to make relationships and have conversations about what this might be. I kept hearing more than anything at the beginning that [the people of Newtown] wanted to be remembered not just as a place of tragedy or as victims, but to transform that and all those cliches about victimhood to empowerment was what I was witnessing. I didn’t meet some of the families until eight, nine months in, but I started to build that trust and see it as a matrix of a community trying to move through the unthinkable and repair their social fabric. Was this always a feature? I didn’t know what it was. It was a very different story in the beginning. Some stories that took me beyond Newtown actually have become shorts, and in those first eight months, I didn’t really want to penetrate the intimacy and the privacy of Newtown — I just didn’t feel it was appropriate, so it was by necessity a different concept, but I did feel that it needed to be chronicled, that many in town wanted to bear witness in their own way — in a slower, gentler way. That’s been a bit of my sweet spot in other things that I’ve done, so I just continued to do it. I was also interested in these interconnected fates and how these lives were touching one another. So much of it for me was about those existential questions about fate and randomness. I wasn’t sure I would get there, but I did have a concept in the beginning of how great it would be to have different perspectives and this was a film where patience was one of the biggest challenges. You just had to be very, very patient and not know where everyone was going to be. You had to give people a lot of flexibility because you’re dealing with traumatized people and not attach yourself to anything really too much because people could be one way one day and then a few weeks later, a different way and you just have to give them that leeway. Everyone’s process of grief is individual, but there was something in the first year where there was just so much shock, people were just inward. They were isolated and it was almost like ice thawing. You could feel people needing to have the catharsis of emoting or speaking and then there was trust-building where someone would hear from someone else, “[Kim’s] okay and maybe this would be a worthy thing to participate in.” I never cold-called anybody and I never pushed anybody, so if I felt resistance, I generally didn’t go back. But it was just taking their lead and letting them have agency in it. The structure of the film isn’t chronological or obvious in any other way, but it pieces together beautifully. How did it come about? With the very, very talented and brilliant editor Gabe Rhodes. The biggest conundrum in the edit room was the day itself. We didn’t want this to be about rubbernecking. It was always [asking] where is the line between bearing witness and something that would be prurient or worse, exploitative? If I was really looking at the emotional experience of trauma, I had to be true to the fact it’s not linear — it’s repetitive — and people were constantly going back to that day in their head all the time. When that custodian says, “There isn’t a day or an hour I don’t think about it,” and he can’t get it out of his head, I felt like the film had to have some truth in that notion that there’s no clear arc. I needed to not have just the incident right at the start and we’re done with it. I needed to reintroduce that piece of it and also at the end, but [show] that there’s no real such thing as closure, but there’s another place. You’re not at the same place. So how do you tell a story that you know in the beginning there’s no beginning, middle and end [since] there isn’t to grief? The best way that Gabe and I could think of [was] that there’s movements. We got a lot out of the Sundance Edit Lab. It was painful, but what came out of all those wonderful creative heads was this idea of emotional mapping. [The film would be] very internal and it’s about finding a journey for the audience that had a range of emotions. Just like an uphill climb, you’d have to have moments where the emotion would shift and in the three families, there are these movements over the course of three years. So that’s how we thought about it a lot – in seasons and metaphor – and we tried to make it more poetic than chronological. When the subject is so much in the national conversation as you’re making it, was what you were hearing influencing what you wanted in the film? That’s where my editor was really great. It was like a dog on a leash that has a scent — I was constantly having the impulse to contextualize. In those drone shots, I wanted to have the voices of radio announcers telling us of other shootings, and [Gabe] would pull me back and keep me spare, [saying something] like, “This is what this film is. This film is really about this insular experience.” Like with the shooter, for example, there was a lot of discussion about how to treat him and this film isn’t an overt political advocacy film, nor is it about the shooter and his motivations. It always has to come through the characters and the community, so the decision not to name him and not spend a lot of time [on him] was an example of keeping it very simple and singular. You actually don’t even make a passing reference to the shooter until halfway through the film, which kept the focus on the families. It became as much about or more about collective grief. I rewatched “Ordinary People” and I always loved that movie because it’s just about the complexity of those three surviving family members and just how complex one nuclear family is – survival guilt, and what they go through. If you look at community as family, the whole essence of that communal psychology became very interesting to me and by extension important to what’s happening to the whole country as we deny that there’s a low level trauma as these things escalate for everyone. At what point did you do the sit-down interviews – was that something that opened up doors at the beginning or did it come more towards the end of the process where you wanted a definitive recounting? We called them the testimonials and they started on the day of the first anniversary where the town had asked no media to come, but I had made these relationships, so a few of the churches invited me. There were certain storylines that they felt were instructive and worthy, so I said to one of the reverends, what would you think about setting up something in the bottom of the church if I set up almost like a confessional, a place where people could go on that very difficult day and bear witness? In the beginning, we would leave — I’d just set up [the camera] and I would leave the room. Sometimes they’d say, “I’m uncomfortable. Come back in.” And we accumulated a lot [of interviews], so that device was something that evolved and we did [more] over the course of the next two years intermittently in the bottom of that church, so those very powerful, intimate interviews come from a very quiet and contemplative space. They weren’t like any other interviews I’ve conducted. When the first responder says, “We don’t need to know what we saw, but emotionally the world needs to know,” and that became the mantra. I also feel that structurally I always saw those [interviews] like pillars or as [part of] a stage play where they were the chorus that would appear at the front of the stage with the light on them and then you would have these scenes at the epicenter of the grief, which was these three participating families, and then everything that revolved around them. Was there a moment where you thought this might be one kind of story and there was something that changed the direction of it? The first interview with Mark Barden, for sure. It was interesting enough in the first seven months that I was following a couple of these faith leaders and just randomly, one day you’re a small-town priest who is at the carnivals and you’re the glue of the community and the next minute you’re tasked with this completely unimaginable job that is overwhelming. When you’re a kid, what’s a town made up of? It’s the doctor and the teacher and the policeman and the priest and each one of [the people in] those roles in Newtown were thrust into something by fate that so was beyond anybody’s capacity. Through that, there’s a part I hope is uplifting about the film, which is the strength that’s required when these unimaginable things become your fate. Whether it be Nicole [Hockley], who is a goal-setting person like a lot of us [who thinks she’s] going to get through this by having certain goals and for Mark, his [sky] jump was completely uncontrived. he told me about sky jumping and I said something about fear, and he said, and he and Nicole said, “Oh, the fear is gone. The worst thing in the world happened to us. There’s nothing more to fear.” It’s as if they themselves had gone through death, so there was nothing that could be scarier, so he said, “I’m planning to go jumping on Christmas time, why don’t you come along?” And of course, the Wheelers had the bravery to have another child, which is really way more complicated than one might think to take that step. But in the beginning, I thought it might be enough to follow that one prism [of the leadership of faith leaders] and I’m so glad I didn’t because Abby Disney made a great movie, “The Armor of Light,” which had that lens, and I was able to round it out with these other [perspectives]. When Mark [Barden] just looked at me and said, “You can only imagine how difficult it is to interpret…I have this need to know what happened,” when he seemed so strong and not in a victim place when he said, I have this need to know what happened, that struck me not because it was ghoulish but because I realized that is the quintessential display of love – to want to experience [the shooting] as if I wish it were me. He never said that, but I imagine that extended desire and need to know is the continuation of parenthood – even though the child’s gone, he doesn’t stop being a parent and loving. He can’t stop that protective instinct. So that really affected me. The way he was just so strong and understanding that he needed to have people look at this, I felt like we need to have their backs. We need to lend them a voice so people can snap out of this denial and this desensitization because it can be you and it can be your town. What’s it been like traveling to all these cities with the film since premiering at Sundance? It’s been varied. We’ve done everything from small, quiet screenings within Newtown for people who wanted them [in those kind of] therapeutic kinds of situations to the White House. We just went to Orlando and the Bardens came with us to pay it forward in a way. We didn’t set out to make a political film, but having said that, the visceral impact of it and knowing that addressing gun violence is underneath it all – you can’t talk about Newtown without that, it isn’t a “Text your Senator” kind of film, but I think people come away with it in very different ways. Based on what we’ve experienced at these screenings, some people come away from it very angry about why more hasn’t happened to address this and others come away feeling inspired by some of the people in the film. People who have lost children have come and say it makes them feel heard, and it’s a depiction of grief and we’re a society that doesn’t deal so well with that, so that’s been really hopeful for me. 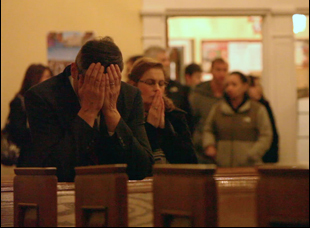 “Newtown” is now playing in Los Angeles at the Monica Film Center and in New York at Lincoln Plaza Cinemas. A full schedule of screenings and dates is here, including a special nationwide screening on November 2nd. NY Film Fest '16 Interview: Shirley Abraham & Amit Madheshiya on Transporting Audiences with "The Cinema Travellers"
Interview: Courtney Hunt on Courting Drama with "The Whole Truth"